UFC middleweight champion Chris Weidman defended his title at UFC 175. He spoke to us about his preparation. UFC Middleweight Champion Chris “The All-American Weidman” defended his title against former UFC champion Lyoto “The Dragon” Machida at UFC 175 on July 5. Coming off two victories over Anderson Silva, the undefeated Long Islander trained hard for 8-10 weeks with Ray Longo and Matt Serra to prepare for the blockbuster matchup against the unorthodox Brazilian. 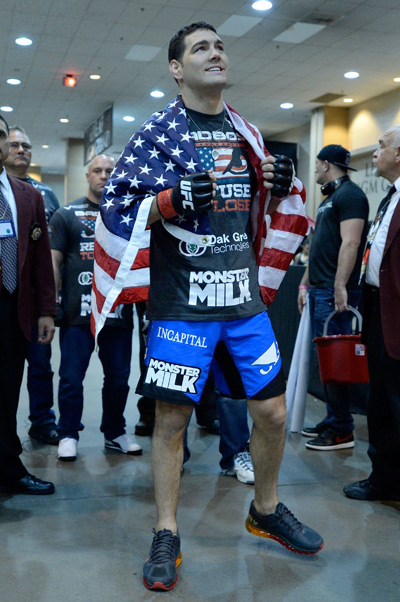 Check out how Weidman got into world-class shape for the marquee matchup. Muscle & Fitness: How are your knees doing? Chris Weidman: I had bilateral knee surgery so both my knees got scoped. I had two torn meniscuses on my lateral side that needed to be taken out. It was a pretty simple surgery and I was doing physical therapy the next day. I am feeling 100% and ready to go. Do you have a heightened level of confidence going into the Machida fight compared to the Anderson Silva fights? I was confident before the Anderson fights and I’m confident now. I respect Lyoto a lot and I expect a war. How did your training change going into this fight compared to the Silva fights? Nothing really changed. I brought in the same sparring partners such as Stephen Thompson, a karate and kick boxer to emulate those guys’ styles. I wrestle twice a week, do ju-jitsu two or three times a week and spar two or three time a week. Can you run through a typical day in training camp? Tomorrow, I’ll do sparring and a bike ride in the morning then I’ll do sparring at 1:00 p.m. and jiu-jitsu at 6:00 p.m.
What are your strength training goals in between fights? Between fights I do more strength and conditioning because that’s when my goals include strength. I try to put on two-three pounds of muscle but between fights I haven’t gotten heavier than 215. What are some of your favorite exercises to do in the gym? I do weighted pull-ups, rope climbs, sledgehammers slams, sprints, hill sprints, deadlifts, curls and bench press. What is your strategy for weight maintenance? I make weight 24 hours before the fight at 185 then I usually fight at about 200. I usually lose about 15 pounds then put it back on after the weigh-ins. What’s it like being the man with the target on your back? It’s the place you want to be. You want to be on top and you want people to come after you. No extra pressure. I’m working as hard as I can and go out there and fight. What is your game plan going into the fight against Machida? I’ll hit him with a jab, circle right, throw a right cross, then when he throws a head kick, I’m going to comeback with a right and look for a takedown. I’m going to try to get my hands on him and pull him down. I want to separate myself from the rest of the guys in my division and let everyone know that I’m going to be the champ for a long time.